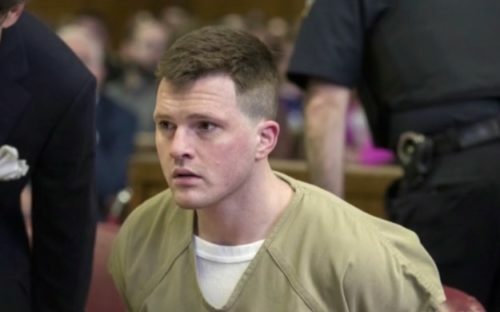 James Rackover who was found guilty in the brutal 2016 murder of Joseph Comunale in New York City. He has been sentenced to a minimum of almost 29 years in prison and could spend the rest of his life behind bars. The alleged lover and adopted son of celebrity jeweler Jeffrey Rackover, 57, hardly expressed any emotion as Supreme Court Justice James Burke sentenced him. Prosecutors say Comunale was stabbed more than a dozen times in a luxury Manhattan apartment owned by Rackover. An argument that likely generated over a lack of cocaine led to the death of Comunale, according to prosecutors. After trying to clean the crime scene with bleach, Rackover and his accomplices ordered takeout. They ate burgers and fries as Comunale’s corpse lay in the bathtub. The victim’s body was found buried and burned in a shallow grave in New Jersey on Nov. 16, 2016. Authorities say Rackover and an alleged accomplice put him there.